If you’ve ever walked into a retail store and wondered why certain music is playing, there may, in fact, be some rhyme and reason to the selection. Research has shown that consumers shop longer and make more purchases when they’re exposed to music. You can use music to make your store so appealing people may want to return — even if they don’t have any buying plans. Music is an important part of any business. It enhances the customer experience, reflects a brand’s personality and can even help increase sales if used properly. However, many business owners make the mistake of choosing music that they like instead of music that provides results. Over the years there have been numerous studies to show how playing different types of background music can influence shopping behavior. Research suggests there seems to be some qualities of music that can influence buying behavior in a retail environment: tempo, pitch, volume and genre. According to the study “Music Congruity Effects on Product Memory, Perception, and Choice,” German music can make customers think of German food, while French music can make customers think of wine, the Eiffel Tower and other French images. Choosing the right music for your shop isn’t as easy as ticking all the right boxes – there’s an art to optimizing your background music for the shopping experience that you want to create. You must first address the theme of your business and how you want customers to feel while they’re shopping. And even then, there are many other variables at play, such as time of day and promotional items. There are many services that offer licensed music for business use, and these services can create playlists tailored for your business. What Types of Songs Should You Choose? Choosing the wrong music for your business can result in customer dissatisfaction. It can cause people to leave your place of business with no desire to come back, which would result in fewer sales. The right music, however, can encourage people to not only stay longer at your store, but also encourage them to come back. One study tested the difference in consumer spending in a wine store when classical music was being played verses pop music. The study found that with the presence of classical music, customers chose more expensive bottles of wine, which resulted in greater overall sales for the wine store. Classical music coordinates perfectly with a wine store because of its inherent association with quality and sophistication. These are traits that you’d want to reflect in this kind of business. If you’re selling expensive, high-class products, classical music might make sense for your store. Rather than picking songs that you like, pick songs that complement the atmosphere that you’re trying to reflect in your store. How loud should the music be? Music is such an effective cue to a brand’s image that it’s often enough to hear notes streaming out of a store to get a sense of what the brand is all about. Imagine that you are at the mall shopping for a suit. You probably won’t enter stores playing rap or dance music, as they are unlikely to stock formal wear. On the other hand, if you were looking for a new pair of sneakers you would probably pop into one of those very shops, drawn by the notes. If you have been thinking about tweaking or re-branding your retail stores, music can be a powerful tool to achieve your brand re-design goals. 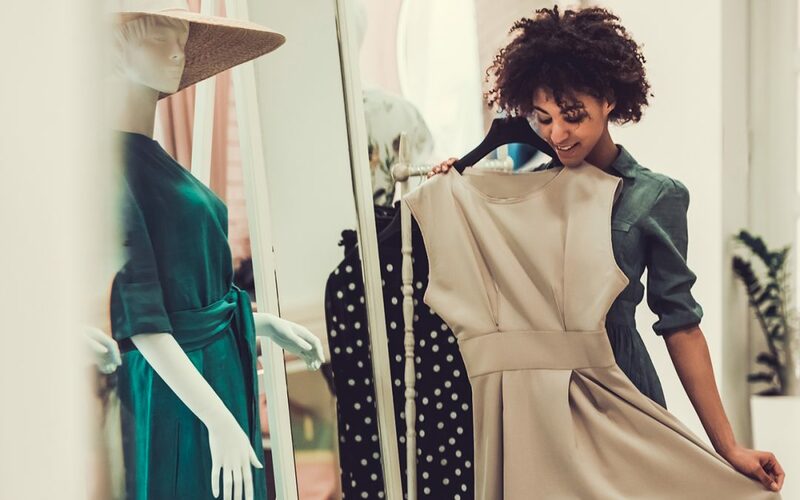 As the competition from e-commerce is getting stronger, the quality of the shopping experience has become one of the key differentiators for brick-and-mortar retail stores. Music plays a big role in creating and enhancing the retail shopping experience, to the point that four out of five small retailers believe that they would damage their store’s atmosphere if they stopped playing music. Research shows that the music you play affects not only the store’s environment, but also shoppers’ moods and feelings. By changing the tempo and style of background music, retailers can create a visible change in atmosphere. As you analyze your store’s ambiance, ask yourself what kind of atmosphere you want to establish. For example, you could create a playful space with high-key pop music, or use slow rhythms to build a relaxed feel. .
By masking the sounds of voices and movements, background music helps create a personal space for customers, giving them privacy as they walk around the store and browse your offerings. With that in mind, it’s unsurprising that a whopping 99% of staff who work in stores without music think that shops that play music are more modern and appealing places to shop. Ouch! Studies show that the speed, rhythm and volume of in-store business music can influence the pace of customer flow through a store. Research has shown that fast music increases arousal, which increases customers’ pace of movement. . Conversely, relaxing music causes people to slow down and look at their surroundings. In 1982, Milliman et al. conducted a study in a New York City grocery store investigating the effect of music tempo on shoppers’ buying behaviors. The experiment showed that playing slow music led to a massive increase in time spent in the store as well as a significant increase (32%) in product sales when compared to behavior when fast music was playing. The stat may be a bit dated, but the influence of music in a retail setting still holds true. A beneficial music strategy will account for these factors and play different styles based on the time of the day and desired goals. For example, a retailer may decide to play fast tempo, louder music when it’s close to closing time, to encourage customers to speed through the store; conversely, slow music could be played during off-peak times, to inspire shoppers to wander around and browse the merchandise for longer. This strategy is known as dayparting. Research has shown that music can affect perception of time. Long lines will feel shorter if there is good music playing in the background. It’s the same principle behind the melodies played while callers are put on hold. If callers are entertained, they are less likely to hang up. Likewise, customers that enjoy the music at your business may be more likely to return to your establishment. To learn more about leveraging the power of music at your location, contact us today or click HERE. Our experts can help you find a sound that’s right for your brand and your budget – so that you can drive lasting results for your business.